Press Release | Yankee United F.C. Trumbull, Connecticut (February 4, 2013): The Women’s Premier Soccer League (WPSL) has announced the addition of the Yankee United F.C. Ladies for the 2013 season. The YUFC Ladies will compete in the East - Mid- Atlantic Division against such teams as F.C. W. Elite (Westchester N.Y.) ,Syracuse Lady Knights, Empire United Buffalo, United FC Binghamton, and the Albany Tri City Celtics. In this their inaugural season the Yankee Ladies will play a 10 game schedule, (5 home and 5 away), beginning in late May and ending in Mid-July with the Mid Atlantic Conference winner moving on to the WPSL Championship rounds. 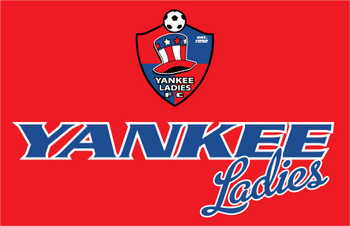 The YUFC Ladies will play their home games at the St Joseph High School field complex in Trumbull, CT.
Yankee United F.C. formed in 1992 to provide the highest level of training and competitive play for aspiring young female soccer players. From 1992 to 2012 YUFC has won 45 Connecticut State Championships, four Regional Championships and a National Championship in 1997.This tradition of excellence has resulted in YUFC teams producing 14 All-Americans, 36 All New England, and 190 players that have earned All-State Honors. Yankee United F.C. teams have produced Yankee players have been selected at the U-14, U-16, U-18, U-20, U-23 US National Team Player Pool, as well as, at the full US Women’s National Team level. Yankee United F.C. Alumni include: Arizona State University graduate, Manya Makoski who is currently playing for Sky Blue FC as part of the new National Women's Soccer League. Boston College graduate Kia McNeil who most recently played for the Philadelphia Independence and the U23 USWNT and Penn State/Boston Breakers goalie Alyssa Naeher who was recently called into the USWNT. This past fall Yankee United F.C. became a charter member of the U.S. Club Soccer Girls National Premier League (NPL). The NPL progressive approach to putting player development as the paramount priority on a club based platform, where nationally recognized girls programs from Connecticut , New York and New Jersey complete in a likeminded environment has been a great fit for YUFC. Mones states “By having a team in the WPSL we now have a place in the summer for our area elite women soccer players to play before, during and after college. I can envision a team comprised of mostly college players with our younger state, regional, and national players as well as some college grads sprinkled in. This is a tremendous honor for our club. We at Yankee take great pride in our player development and this is another avenue and opportunity our players can use to improve. The Yankee Staff will be led by Co-Coaches Wayne Mones, Jack Nogueria and WPSL Technical Director Matthew Mones. Wayne Mones holds a NSCAA Advanced Diploma and played his soccer at the University of Connecticut. He was the Head Coach of the Western Connecticut Men’s program for 17 years and was inducted to its Hall of Fame in 2009. He was named New England Coach of the year in 2002. He is currently the DOC and President of Yankee United where he has coached for the past 29 years, as well as, the present Head Coach of the Yankee U14 NPL Team. Matthew Mones played college soccer at Marist College winning two MAAC Conference Championships, as well as, earning All-MACC Rookie honors before transferring to play at Boston College in the ACC. As a youth player he was a member of the CT State ODP and Region I ODP team that competed in France, as well as, a US Youth National Pool Player. He currently holds a NSCAA National and Advanced National Diploma. He is presently the Yankee Director of Player Development and Coach of the Yankee U12 and U15 NPL teams. YUFC plans on fielding the most competitive team possible with the overall team goal of vying to win the WPSL Championship. As an early step in that direction, Yankee Ladies have signed a former High School All-American Alex Uscilla of University of Hartford, as well as, three current Yankee U17 Strikers players, Darien Dunham (Cheshire Academy) current member of U18 USWNT Pool, Keely Lockwood (Ridgefield High School) a current ODP Regional Team Member and Sabrina Toole (St. Joseph High School) a 2012 All-American Selection.